The Opera pen was designed with what is known as the "squaring the circle" barrel. A round pen is squared off, but with a comfortable to hold design. No sharpe edges to this pen. 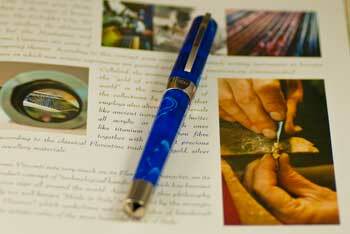 This is an innovative design by Visconti that has been imitated by other pen manufacturers. Inspired by the Vitruvian Man of Leonardo da Vinci, inscribed inside both a square and a circle, it gives the pen an ergonomic shape: squared and round at the same time. I particularly like this as when the pen sits on the desk top, there is no fear of the pen rolling off the desk. 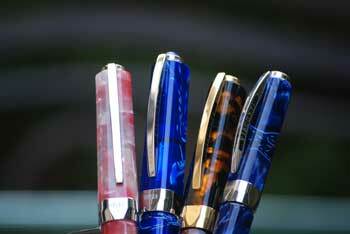 The pens are 5.3" capped, 5.2" uncappted and and nice 6.5" when the cap is posted. The body is for a me a good size at .5" in diameterhn when measured where the cap meets the body. The line comes in a range of colour with the pen body and cap being acryloid — resin with celluloid insertions. The Opera line, part of the Regular Edition Series of Visconti, are available with 14 k gold Fine, Medium or Broad nibs. The pens have a converter filling system. My first Opera is a a beautiful blue with a white grain. Semi-transparent, the light nicely reacts with the pen. The pen has a great Broad nib so this is one that I find myself using on a regular basis. The pen nicely sits on a desk because of the rounded square design so even if you leave the cap off the pen, not posted, you will not have to worry aabout this pen rolling off the desk in a nib-death dive to the floor. 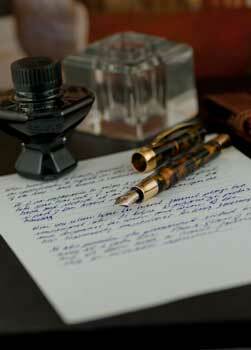 The contrasting platinum trim gives the pen a pleasing modern look. This pattern is exclusive to Visconti and not available in retail stores. They fitted it with a Broad nib and it is a very smooth writing pen. 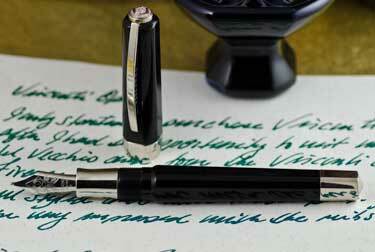 The platinum-plated gold nib is responsive to the touch. As soon as the tip touches the paper ink flows. The pen is very comfortable in the hand. My wife Karen has a beautiful pink and gray model. Subtle colours. It also is a colour that is not available through retain stores. Hers was also fitted with a Broad nib and will has the same high quality smooth writing, it is an other example that nibs, when hand made vary and this Broad is a bit finer than that which I have in my Blue model. I also have the Opera in a basic black and a Tobacco semi-transparent special edition The Tobacco, with a semi-transparent body was in production for a limited time. It is very similar to the look of the Masters Line that was relates as few years late. The Masters, which very similar to the Opera Club, is a much larger pen and has the double reservoir filling system. The cap and barrel are a beautiful translucent brown, gold and black. The nib, a 14 Kt gold, one tone. The nibs are available in Fine, Medium and Broad and the Broad nib that I have delivers a great line of ink on the paper. Converter filling system so that you can use any of the great inks available to complete the writing experience.